What is so eco-friendly about bringing your lunch to work? Most noticeably, it cuts down on packaging and waste, as long as you use re-usable containers from your home. You’re also using up leftovers rather than letting that food spoil and go to waste. Plus, by not driving on your lunch break, you’re saving on fuel and carbon emissions and keeping miles off your odometer: those short trips add up over the course of a year. 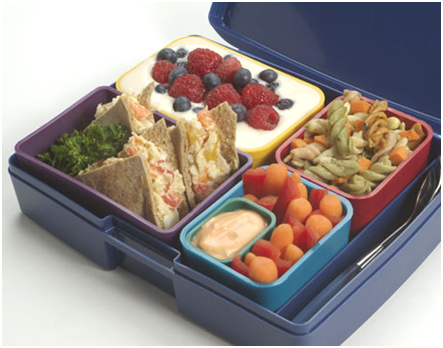 These stylish lunchboxes are eco-friendly and contain NO phthalates, bisphenol A (BPA), or lead. They are available in a variety of styles and colors from www.laptoplunches.com. If you pack your lunch from home, you have a lot more say in its ingredients. Almost all restaurants (both fast-food and sit-down) use much more oil, fat, and salt than you would cooking from home. If you bring your own lunch, you can control the ingredients, choose a balanced meal, and set a healthy portion size. Make sure to bring a healthy snack so you don’t rely on a vending machine come mid-afternoon! It may sound like this is a lot of extra work, but in truth you can pack your lunch and snacks in just 10 minutes a day – how long does it take to leave the office and buy lunch each day? This also means you have more time to actually relax over your lunch break. Read a book, sit and chat with a colleague, or go for a short walk. You can even eat outside when the weather is nice. There are so many reasons to bring your lunch to work – now is a great time to make this not just a goal, but a habit!